Mixture of mineral oil, linseed oil and tung oil gives the same quality finish as the factory. Food-safe oil finish keeps your blocks looking new. Oiling your tops or blocks every 4-6 weeks is recommend. 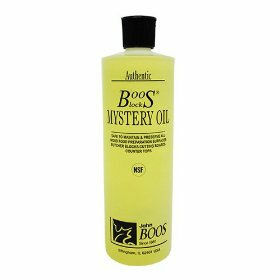 This all-natural unbleached beeswax and food grade mineral oil formula not only enhances the beauty of your wood products with color and sleek appeal, it also provides a finish that extends the longevity of your John Boos butcher block table. It is extremely important to give your cutting boards, blocks, and tables a good oiling on all surfaces every 3-4 weeks. Your Boos product shipped from the factory with a penetrating oil finish which allows for great cutting, chopping, and slicing. 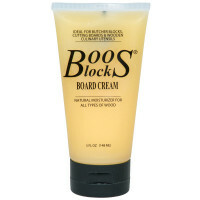 We recommend keeping your Boos product oiled with John Boos Mystery Oil or Board Cream. When your product becomes dry and lighter in color, you know that the time has come to re-oil. With a minimum amount of care and maintenance, you can lengthen the life of your Boos purchase by many years. John Boos products are built with great quality and fine craftsmanship. With a minimum amount of care and maintenance, you can lengthen the life of your Boos purchase by many years. Below you will find information on easy steps to help protect your product and other information. Congratulations! You have purchased the most beautiful, versatile, durable natural solid surface counter top made. 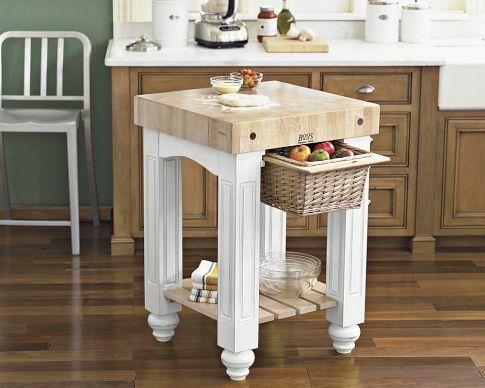 If properly installed, this John Boos butcher block top will enhance your home for many years with only minimal care. With a miminum amount of maintenance, you can lengthen the life of the top of your Butcher Block from five to ten years. All Butcher Block products must be oiled on all surfaces with a natural mineral oil at least once a month to protect the wood. Click here to download and read the PDF file. Use a good steel scraper or spatula several times a day, as necessary, to keep the cutting surface clean and sanitary. Do not use a steel brush on the cutting surface of your block. This and other simple maintenance tips will help you lengthen the life of your Block five to ten years. In-depth instructions on the care and maintenance of Stainless Steel. Covered are the tools and cleansers recommended. Other vital imformation about stainless steal is included in this documentation. Excessive moisture and certain chemicals allowed to stand on a finished surface can cause damage. Be sure any spills are cleaned up immediately. Read the John Boos Product Warranty. Information covers what is covered and what is not, including damages, repairs and replacement, factory obligations and length of warranty. A study conducted by Dean O. Cliver, Ph.D and others at the Food Safety Laborator shows that wooden cutting boards are not hazard to human health, but plastic cutting boards may be. Information from a recent study commissioned by the American Hardword Export Council and condcted by a tem of international expers led by Alberto Goetzl, of Seneca Creek Associated LLC. A diagram on the proper procedures of overhang installation on kitchen counter tops.